If you always find yourself in search of a good, easy and natural solution to cleanse your face and at the same time keep your acne-prone skin under control, I guess you are like me. This time my antennas got hooked on Aspen Kay Naturals Dead Sea Mud & Charcoal soap bar and that was how this review was created. Here, you will find everything you need to know about what skin needs and conditions this soap is best for, what the company´s claims are and how they can be justified according to the product´s ingredients as well as what the users like most about this soap and my final conclusion. Have you ever tried a Dead Sea Mud Mask? It is a completely natural product that derives from the actual Dead Sea located in Israel. Dead Sea Mud is rich in salts as well as minerals such as magnesium, sodium calcium, potassium and more. According to WebMD, a low intake of magnesium through your diet is a risk factor for inflammation and several diseases. So, it is understood that balanced levels of minerals in our diet is a very important step to prevent inflammation. Now, inflammation can negatively affect the skin as well, triggering problematic skin issues as well as premature skin aging. Topical application of natural products that are rich in those minerals such as Dead Sea Mud can help your skin fight inflammation and combat inflammatory skin issues such as acne, rosacea and even eczema more effectively. Remove dead skin cells and leave your skin clean, rejuvenated and glowing. Have a healing effect on skin suffering from eczema, psoriasis, and acne. My intention was not to make the title above sound so serious, but you are getting an idea of what this section will be about. So, let´s have a look at the ingredients and relate them to the actual benefits the company claims that their product has. As we have seen before, the Dead Sea Mud is rich in minerals that can fight inflammation and therefore, this soap can have a positive effect on people who suffer from inflammatory skin issues such as acne, rosacea, and others. It is also a well-known fact that inflammation can cause premature skin aging, so products that fight inflammation can help in preventing skin aging or reducing signs of aging. In addition, Aspen Kay Naturals Dead Sea Mud & Charcoal Soap contains unrefined shea butter which is nourishing and hydrating as well as olive oil and castor oil which can prevent your skin from getting dry. Also, activated charcoal is another ingredient that is well known for its ability to cleanse pores, reduce oiliness and prevent the appearance of blemishes including acne. Finally, this soap is lightly scented with a blend of essential oils which contains eucalyptus, peppermint, and lemongrass. Lemongrass essential oil has astringent and antiseptic properties while eucalyptus is anti-inflammatory and peppermint has antimicrobial properties. Contains all natural and organic ingredients. 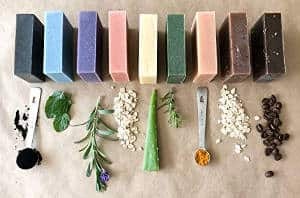 Vegan soap that is suitable for all skin types. Handmade and free of preservatives and other chemicals including artificial dyes and fragrances. Suitable for men, women as well as teens. Can be used for face, the body as well as hands and even shaving. The company indicates that since this soap will draw impurities out of the deeper layers of your skin up to its surface, you may actually experience more acne breakouts, but this is normal and it is a sign that the product actually does work to remove those impurities. In addition, they suggest that it commonly takes approximately 1-2 weeks until the skin clears up. Prevents zits and heals prior acne breakouts. Fades acne scars and reduces skin damage. 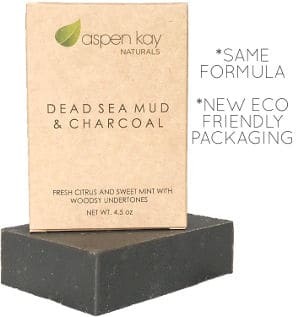 Aspen Kay Naturals Dead Sea Mud & Charcoal soap bar is a good quality all natural product that is completely free of chemical fillers. It can keep your skin clean and prevent acne breakouts without causing dryness. Since everybody´s skin is different, just remember to give it 1-2 weeks till you draw conclusions relating to its effectiveness in deeply cleansing your skin.